The SHAPER module lets you shape the audio signal’s attack phase independently of the decay/sustain phase. At 0%, transients have muted attack and round long notes. At 50%, the signal is clean. At 100%, transients have Sharp and prominent attack with shortened notes. Clipping LED. 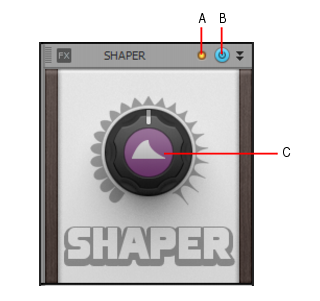 Shows if the input signal to the SHAPER module is clipping. If there is any distortion in the ProChannel signal chain, the clipping LEDs let you identify where the clipping occurs. SHAPER enable/disable . Enables/disables the SHAPER module. SHAPER. Adjusts the attack shape. At 0%, transients have muted attack and round long notes. At 50%, the signal is clean. At 100%, transients have Sharp and prominent attack with shortened notes.